Reasons for wanting to ride a motorcycle vary: the freedom of the open road, the feeling of the wind through your hair, and speeding through the countryside without a care. These romantic reasons may be attractive, but riding a motorcycle is more about control and responsibility, which requires a learner permit or a licence. Of course, earning your learner permit, and then licence later on, takes some effort on your part. You need proper motorcycle training from an accredited academy, and then pass the motorcycle learner permit or licence tests. Follow the few simple steps outlined below and you will be on your way toward becoming a safe and responsible rider. At Ride-Tek, we’ve been helping novice motorcycle riders in getting their learner permit for the past decade. 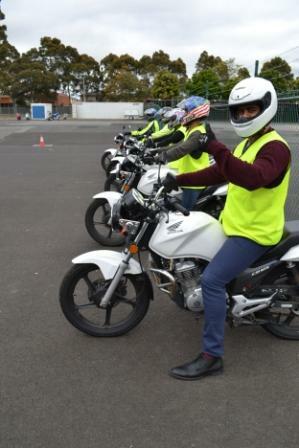 Our trainees are taught the 5 basic steps to becoming a skilful rider. These steps are related to familiarising yourself with a motorcycle and practicing fundamental riding skills. Helmet – Protects your head. Several types are available, but we recommend a deeply cushioned helmet with a full visor. Gloves – Well-padded motorcycle gloves that extend above the wrists to protect your palms, knuckles, and fingers. Jacket –Jackets offer extra padding and warmth to your body. Pants – provide extra protection for the lower body. Boots – protection for the feet, shins and ankles. They also help you plant your feet firmly on the pegs. Acceleration – twist the hand grip down to rev up. Be careful and twist smoothly. Braking – pull the lever gently to apply the brakes smoothly. Rear brake – press the pedal for low speed manoeuvring. Not ideal for stopping the motorcycle. Clutch – the lever over the left handle grip, which is needed when changing gears. Gears – use the pedal to change gears. 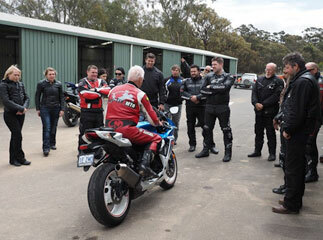 A key part to any motorcycle training is learning how to change gear smoothly. Motorcycle gears have a mechanism different from cars. The lever under your left foot allows you to shift gears. It is a little tricky however, but nothing to worry about, just a bit of practice. The shift pattern runs from neutral push the lever down for first gear then once the clutch has been let out and the motorcycle the engine has reached suitable revs click the lever up for second gear and so on. It is a lot easier in practice than reading about it. Neutral is between the 2nd and 1st gears. It takes a little practice but eventually you’ll get it! To start your engine, simply turn the key in the ignition, but you have to flick the ‘kill switch’ first. Remember to warm up the engine, so rev (gently!) for about 45 seconds. Don’t forget to flip up your kickstand – and flip it down when you stop. 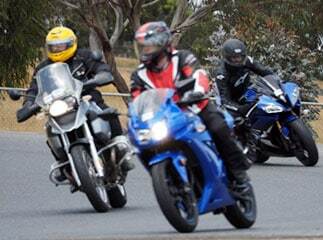 Training courses are essential for mastery of your motorcycle. Sign up to our Ride-Tek Pre-Learner course to master the basics of motorcycle riding and earn your learner permit. 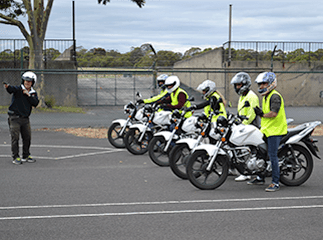 Under Victoria state law, only VicRoads accredited riding schools can issue a learner permit and motorcycle licence. 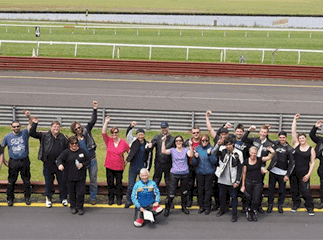 And Ride-Tek is a fully accredited motorcycle training academy.